Camp in Field before Vicksburg, Miss. COLONEL: I have the honor to report the marches made by my command and the part taken by it in the battles fought during the campaign from Milliken's Bend, La., to this camp. During the night of the 14th, I supplied my command with three days' rations of sugar, bacon, and meal, and some other articles, most of which my quartermaster obtained from the penitentiary, and on the morning of the 15th my command marched back on the road toward Clinton, and passed through that place and bivouacked 4 miles west of it that night, having marched about 14 miles. On the morning of the 16th, I moved my command at an early hour along the road toward Bolton and Edwards Depot, following the Third Brigade and Logan's division. I had marched but an hour and a half when rapid firing of artillery in front again announced the presence of the enemy. My command moved forward rapidly, and arrived upon the field about the time the engagement became general. I formed, as ordered, under cover of the woods, at the right of De Golyer's battery, and about 400 yards distant. During this formation I was under a light fire of artillery and musketry, from which I lost a few officers and men. As soon as my command was reformed, I received an order from General McPherson, commanding the corps, to send two regiments immediately to the support of De Golyer's battery. I ordered forward the Fifty-ninth Indiana, with instructions to form on the left of the battery, and the Fourth Minnesota, with instructions to form on its right. This order was complied with in double-quick time, and about the same time the regiments were so formed the enemy commenced falling back at this point (the enemy's left), and the regiments advanced, the Fourth Minnesota across the ravine, capturing 118 prisoners, and the Fifty-ninth Indiana into the ravine, bearing farther to the left, and the enemy's line crossing the ravine diagonally at this point, capturing here the colors of the Forty-sixth Alabama Regiment (Sergt. 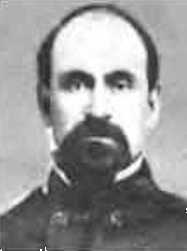 John Ford, Company C, Fifty-Ninth Indiana, captured them) and many prisoners. These regiments retained their positions on the right of our lines till the close of the engagement, about three hours. By the time these two regiments had got into position on the right and left of the battery, I was ordered to take the other two of my command, the Forty.eighth Indiana and Eighteenth Wisconsin, about 100 rods to the east of the battery, and form there in the edge of the woods, in support of what seemed to be General Hovey's right. The Forty-eighth Indiana Regiment immediately went into position under a most galling fire of musketry, and retained it for at least three hours, and long after the regiments on its right and left had given way, and then fell back by my order a short distance, to replenish ammunition, only after it was exhausted, but stood like a wall of adamant wherever it was placed till the close of the engagement. The Eighteenth Wisconsin was moved from right to left and back two or three times, by order of the general commanding, as the attack was made more fiercely on either hand. The regiment moved with great promptness, and held every position firmly until removed by orders. After this engagement ceased, I moved forward on the Vicksburg road about 3 miles, and bivouacked for the night. The conduct of all the officers and men of my command during the entire campaign has been more than satisfactory--it has been most gallant and praiseworthy. There has been no shirking and no desire to shirk on the part of either officers or men, and I have not found or even heard of a man out of his position in battle or on the march. I know not how soldiers could do more. Capt. L B Martin, assistant adjutant-general, and Lieutenants [John S.] Akin and [James H.] Donaldson, aides-de-camp, have conducted themselves in the most gallant and faithful manner and deserve special mention. The living are rewarded by the consciousness of having done all that human nature is capable of to suppress a most wicked rebellion and to preserve order and good government for themselves and posterity. But alas, for the patriotic and gallant dead; no language of mine can do justice to their virtues. May some Macauley or Bancroft recite in interesting narration their hardships, endurance, patriotism, valor, and achievements, and some modern Homer or Virgil live to sing them in heroic verse.